California Living ® host Aprilanne Hurley spotlights featured recipes like the folowing Napa Valley Crab Cake Recipe compliments of Jeffrey Starr, Trinchero Family Estates Winery Chef , who whipped up this, and numerous other fabulous recipes on location at the Sutter Home Inn, Napa Valley, California, with California Living ® host Aprilanne Hurley. For the Crab Cakes, if the crab meat is excessively wet, squeeze out some of the liquid. In a bowl, combine the crab meat, 1 cup of the bread crumbs, chives, and mix. Add the mustard, mayonnaise, Tabasco, black pepper, and mix again. Taste and add additional Tabasco and black pepper if desired. Shape the crab mixture into 12 equal sized cakes, about ¾” thick, and coat the top and bottom surfaces with the remaining ½ cup bread crumbs. Sauté the crab cakes over medium heat in olive oil until golden brown on both sides. Remove to absorbent towels. Combine the Champagne vinegar, honey, Dijon mustard, shallot, and thyme in a bowl. In a slow, steady stream, whisk in the olive oil. Season with salt and pepper. Combine in a food processor the garlic, egg yolk, lemon juice, and tarragon leaves. Process until smooth. With the processor running, add half the olive oil drop by drop and the rest in a slow, steady stream. Salt and white pepper, to taste. Refrigerate. 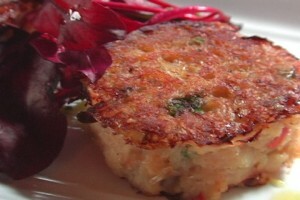 When ready to serve: Sauté the crab cakes over medium heat in olive oil until golden brown on both sides. Remove to absorbent towels. Toss the slaw (see below) with the mustard vinaigrette. Divide the dressed slaw between 8 plates. Place a crab cake on top of the slaw. Drizzle (a plastic squirt bottle works great for this) the tarragon aioli on to the plate around the slaw.To Serve: Place sautéed crab cakes on a bed of colorful slaw you can make by shredding red and green cabbage, Napa cabbage, carrot, red bell pepper, green onion and/or any other vegetable you would like. 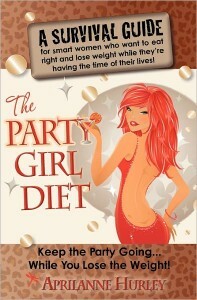 Check out the special FREE Kindle promotion available NOW through Amazon’s Kindle Matchbook program spotlighted in the California Living® TV commercial above…and “Keep the party going while you lose the weight” this season. Aprilanne Hurley, ca living, CA Living TV, California Living, Crab Cakes Recipe, food and wine pairing, Jeffrey Starr, Napa Valley Chefs, Napa Valley food & wine, Napa Valley napa valley. Bookmark.